What is Symbol Mapping and how to use Symbol Mapping Manager in PTMC platform? Symbol mapping is a tool for you to use market data of one data provider while sending orders to any other broker you wish to trade with. In a nutshell it allows you to create link between different data feeds and Order Management Systems. This allows you to reach even more profit from trading stocks, options, futures, ETFs, securities and other instruments with any exchange of the world. With that you will be pleased to use simple and totally intuitive software that is provided with our easily understandable step-by-step guide. As you can see, the pros are considerable enough, so let's examine how to use Symbol Mapping Manager. In order to have such an opportunity you have to complete a few plain steps. Having configured the necessary connection, please launch PTMC platform;You can browse steb-by-step instructions using the example of Interactive Brokers connection with PTMC as well as creating multi-connection with Interactive Brokers and IQFeed. b) start entering the necessary symbol in the respective field as it is shown on the picture below. Having started entering the symbols, possible options that suit your entered symbols will be automatically offered to you in the drop-down list. Select the necessary symbol from the list. Or you can open more detailed menu (Lookup) with wider range of settings (see the picture above) that will help you to select the ticker using some categories as follows. Symbol Mapping Manager window will be opened automatically. In the left side of the opened window you can see the ticker and the respective exchange separated by ‘@’, you have entered before.That is the ticker provided by the broker you will send your orders to. As brokers and data providers use different codes for the same instrument, exists a necessity of selecting respective equivalents of the instrument. So you have to enter equivalent of the same symbol provided by data provider. 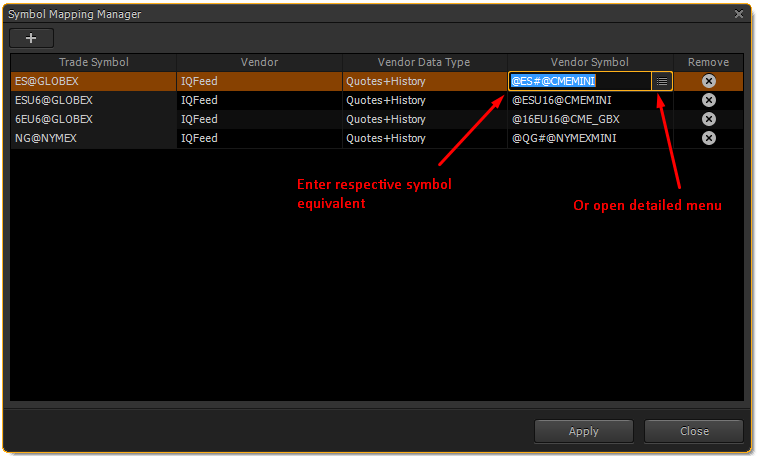 In case you have already created Symbol Mapping link, it is already saved in the cache and you can easily find it by opening the detailed menu (Lookup) at the end of the field or by opening the Watchlist panel. Click on the Apply button and here you are! Try Symbol Mapping Manager by PTMC and enjoy your trading! Some tools provide this mapping automatically, could you do so ? that will make it much easier to use.